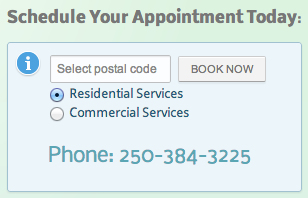 Our new online booking system makes it easier to make an appointment. Now when you visit our site you can go online, at any time of day, and schedule your cleaning appointment at a time that is convenient to you. Choose the best time and day and receive a confirmation by email. Only want an estimate? Just enter your postal code and click on the booking link. All of the prices will be displayed, but you don't have to schedule at that time. Our system is as accuarate as possible, but cannot be completely accurate. For greater accuaracy, make a quick call to our office will reconfirm the details. Upon our technicians arrival, all jobs will be measured or recalculated to reflect the true cost.